This video footage of Sailing Yacht A shows her with her towering free-standing masts and illustrates the jaw-dropping scale of the world’s largest sail-assisted yacht. It is when a tug passes that you begin to realise quite how large this vessel is. At 143m/470ft she is nearly 200ft longer than the Cutty Sark and what was once the world’s largest modern sailing yacht, the 289ft/88mMaltese Falcon. The footage was taken during early seatrials near Kiel and the Nobiskrug yard responsible her construction in Germany. Sailing Yacht A belongs to Andrey Melnichenk, a Russian industrialist with a net worth of nearly US$ 9 billion. The details of Sailing Yacht A were kept surprisingly secret during build, and her interior is still to be completed. Now built and launched, she easily surpasses the 96.35m Sea Cloud as the largest sailing yacht afloat. And it is primarily her sheer size that we are drawn to – I am fairly confident that this craft will rarely be described as a ‘looker’. In fact, the unusual shape of Melnichenko’s latest project divides opinion even more than his previous superyacht, the 119m Motor Yacht A.
Philippe Starck designed both projects, but Sailing Yacht A arguably more resembles a motoryacht with masts than a yacht. Starck by design, stark in appearance, she has a bulbous bow forefoot and a triangular profile with vast oval portholes that are completely flush. 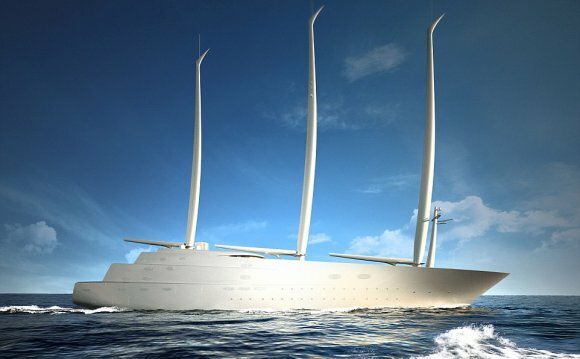 Sailing Yacht A is rumoured to have cost £260m. Her steel hull has eight decks, an underwater observation room in the keel, and accommodation for 20 guests and 54 crew. Dutch firm Dykstra Naval Architects designed the rig (and keel), Magma Structures in the UK built the giant masts, while Future Fibres made the custom booms. The three free-standing masts are the world’s tallest carbon composite masts and took over 70 people over three years to build at Magma in Portsmouth. Each weighs around 50 tonnes and supports a sail area greater than a standard sized football pitch. Sail deployment, setting and reefing is all push-button controlled. Although quirky looking, this ground-breaking project has purpose behind her sheer size – it may serve as a demonstration to cargo ship owners that sail is a practical adjunct to power in the drive for fuel saving.